Christmas at Washington Place, 1858. Ka Nupepa Kuokoa, Buke XLVII, Heu 29, Aoao 5. Iulai 22, 1910. Two gifts in one, 2014. Are you looking for the special gift for someone near or far? When you pick up calendars from the Hawaiian Historical Society, you are giving two gifts in one—a calendar for your loved one, and a donation to the Historical Society as well! 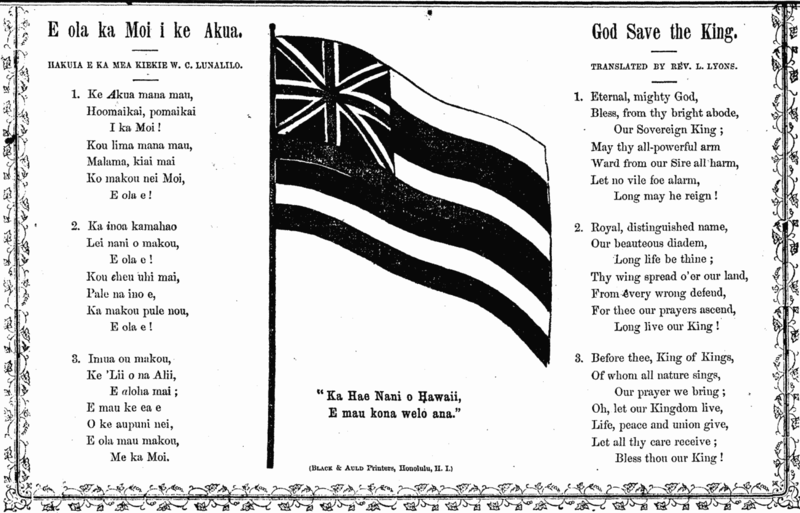 The Hawaiian Historical Society’s Hawaiian history calendar for 2015 is now available. The new calendar features historical photographs of outstanding sites in Hawaiʻi state parks on Kauaʻi, Oʻahu, Maui, and Hawaiʻi Island. Many of the places that are now part of the park system have long attracted residents and visitors alike. The photographs chosen for the calendar exemplify the scenic beauty and unique natural features that have made these locales favored destinations for many decades. 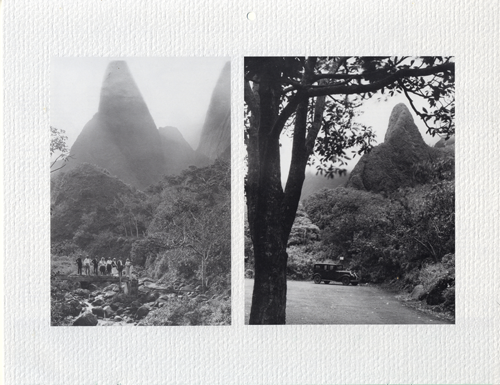 Iao, one of the scenes from the 2015 calendar. The photographs in the calendar were gleaned from the collections of the Hawaiian Historical Society, the Hawaiʻi State Archives, the Bernice Pauahi Bishop Museum, the Kauaʻi Historical Society and the Hawaiian Mission Children’s Society Library. They date from the1860s through the late 1930s. As always, the calendar’s pages are filled with notes about significant dates and interesting facts in Island history as well as the phases of the moon. They are great solutions for seasonal gift-giving quandaries. Society members can purchase copies of the calendar for $8.00 each (plus $3.00 postage when mailed to you). The retail price is $10 per calendar. Bulk rates are available. The calendars can be obtained directly from the Hawaiian Historical Society office at 560 Kawaiahaʻo Street, Honolulu, HI 96813. Telephone (808) 537-6271. Look for them at the annual HHS open house and book sale December 11. The 2015 Hawaiian history calendar is also available at the following book and gift shops: Native Books at Ward Warehouse; the Mission Houses Gift Shop; the Hawaii State Art Museum Gift Shop; and Kailua General Store. For more information, see the Hawaiian Historical Society web page! Aloha Aina, 1871 / 2014. Composed by His Highness, W. C. Lunalilo. Speech of the New Zealander. 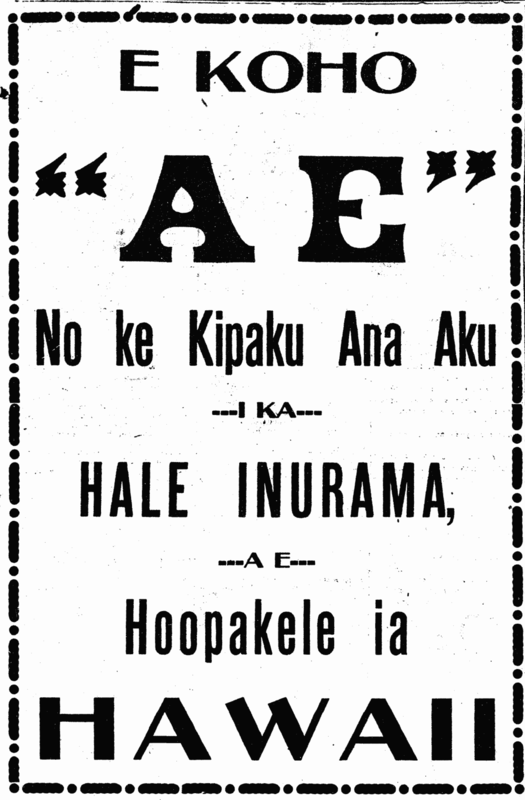 Wheraliko Rawei, a man from New Zealand [Nu Kilani], gave [a speech] in the YMCA building [Hale o ka Hui Opio] of Honolulu nei. The topic of his presentation pertained to New Zealand, the land of the Maori people. He is a native New Zealander, and is fluent in English. He was well educated in that language in schools of the land of his birth. His presentation was enhanced with lime light pictures [kii hoolele aka]; these pictures were of the very famous places of his homeland. His speech was made very delightful with songs of New Zealand. There were many people of this town who showed up to listen to his speech. All of the seats were filled by the spectators, and some people stood. He gave another presentation on this past Thursday. 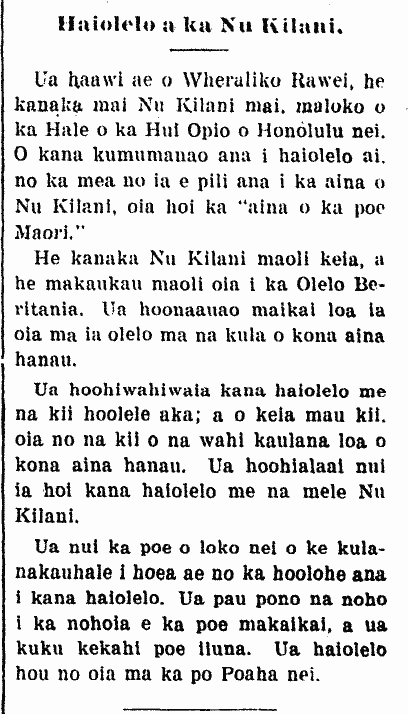 Ka Nupepa Kuokoa, Buke XXXVIII, Helu 39, Aoao 1. Sepatemaba 29, 1899.